We know that this universe operates according to certain laws and to be obedient to these laws for creating a life that we desire, we need to be in a higher vibrational state that should reflect our desires. In other words, our inner world is what gets reflected in our outer experiences. We discussed about the role of actions and importance of emotions in the previous post, here we are going to discuss about the key to live the abundant life and the types of actions. It’s fairly obvious that a person’s priority should be first achieving that inner peace and joy before proceeding with any physical action. We should always keep in mind the law of non-resistance and remember “whatever we resist will persist”, this means working hard to achieve something or putting the inner peace at stake for achieving material possessions will not only delay the good from coming to us but it also wastes our physical and spiritual energy. Many people say that the law of non-resistance is for the losers, what the wise men have taught us indicates that holding such false beliefs and defying the law of non-resistance will only lead to failures. The mistake that people often make is that they think that doing things with ease is cowardliness; actually it requires courage to overcome such deeply entrenched beliefs instead. We are well aware of this category; it involves working hard or in a crooked way blindly with no emotional involvement. Most of the people in the world today are engaged in these types of actions only, and it keeps them busy with something that they only do to gain wealth. Physical Energy – Used more than it should be. Spiritual Energy- Directed towards lack of wealth. Result- Chaotic state of mind, desires unfulfilled, health is lost! These types of actions are done for gaining respect, confidence and trust of others. Charity and Volunteering work done with an intention of making oneself valued also comes under this category. Here a person does something for which he is not very enthusiastic but his ego forces him to do this. Actions done for the sake of relationships also come under this category. Physical Energy – Used according to the free will. Spiritual Energy- Directed towards insecurity. Result- Always facing negative circumstances in society, family and friends. Both “Duty” and “Responsibility” is a man made set of ideas which tends to decide the value and righteousness of a person. God never sent a person on earth with a prepared activity book! Violent activities like terrorism also have a root in this category because they believe it’s their “Duty”. This category is more satisfying than the previous one because a person has a proud feeling while doing these actions. Physical Energy- Used according to the requirement. Spiritual Energy- Directed towards “lack of independence”. Result- Living a much respected life among others, but an obstinate emptiness inside keeps them in a chaotic state. These are those actions that are done to “reserve a spot in heaven”. Most of the charitable works comes under this category, it is of course a better action than any of the above listed, but an individual does this for gaining better“luck” and god’s attention. People who have crossed the age of 50 are mostly found doing these activities. Physical Energy- Used according to the free will. Spiritual Energy- Directed towards lack of “good luck” and fear of death. Result- Prosperity flows in their life, people respects them, but still they are unable to get the peace of mind whereas health starts to deteriorate at a fast rate. 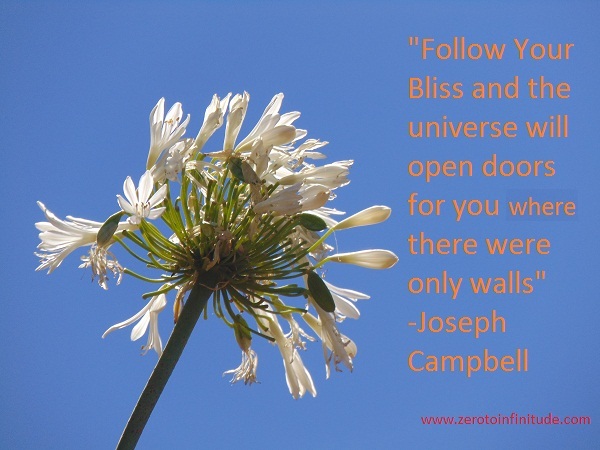 This is that Joseph Campbell’s “follow your bliss” concept, it is doing what you love to do. This action follows only when a person attains that “peace of mind”, come into that “higher vibrational level” and only then he does something with complete involvement, in this state he becomes so much indulged in his work that hours passes like seconds for him, its a meditative state. Prosperity, love, health and abundance in all the areas of life follows when a person gets aligned with-“who he truly is”. Spiritual Energy- Directed towards growth. Result- Living a life that gives all worldly and spiritual fulfillment, this individual also contributes a lot towards the growth of the world.